Our year of companions kicks off in delightful style! 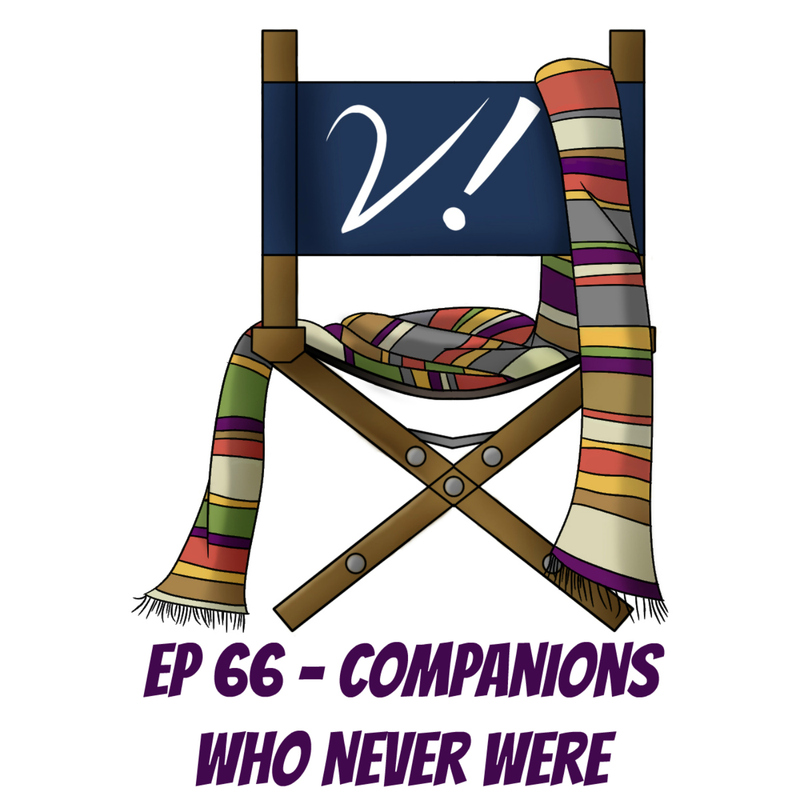 Join Deb, Erika, Katrina, and Tansy as we discuss those Doctor Who characters who were almost companions–those who were slated to become TARDIS travelers but never did, as well as those who we wish had stuck around. Deb accidentally invents a new word*. Kat is thoroughly predictable. Erika unabashedly cheats. And Tansy has a list! I wish Duggan from City of Death had travelled in the TARDIS for a while. I can’t believe I forgot Duggan, he is my favourite and my best. He is TOTALLY my Canton. One of the points the episode touched on was the dynamic not just with the Doctor, but in the crew overall. The Doctor / Romana / K9 team cashed a lot of comedy out of the fact that as nominally brilliant as the Doctor is supposed to be, he’s easily the dumbest person on that team. Duggan’s amiably dim thuggery alongside the Doctor and Romana was one of the things that made City of Death so great, by shaking that up. He also gets to be Romana’s companion when the two of them get split off from the Doctor for a while. Now, it’s probable that that dynamic would have worn thin pretty quickly, but I felt that it hadn’t come close to overstaying its welcome. Great conversation, as always. Thank you! In the early part of the discussion, you all seemed to agree that we’re not looking for conflict, but I do not recall anyone using the phrase “dramatic tension” which I submit is what we are looking for. That can mean conflict, but it can also mean differences of experience or perspective. First and foremost, I would have wanted to hear the names Henry Gordon Jago and Professor George Litefoot mentioned in this context! In addition to their own fabulous series of adventures from Big Finish, there have been a few audio adventures where Jago and Litefoot traveled with Colin Baker’s Doctor as companions. I suspect they showed in Big Finish in the first place because they were important “Confanions” in the mind of Justin Richards or one of the other decision makers there. Another character I would put forth is Ling Tai, the young character that becomes a friend of Ace in Battlefield. Having given a lot of thought to the Hex and Ace relationship, I think McCoy’s Doctor works very well when there are two companions. He so often keeps things from Ace that the story can include much more exposition if Ace has someone to talk to and confide in. The Ace/Hex chemistry is amazing, but I think Ling Tai could have brought very similar sorts of notes to the televised series. I’m going to mention Elton Pope in this context. Of course there are a few elements of Love & Monsters that merit serious criticism, but I adore Marc Warren and I think it would be interesting to see the Doctor travel for a short time with someone so enthusiastic. I also would like to see Georgia Moffett’s Jenny as a companion. Unlike some fans, I would like to see the family side of the Doctor explored a little more on screen. I also really liked Shona. I think bringing a character that feels a little like Lucie Bleeding Miller along with Capaldi’s Doctor would be very interesting. I’d be all over seeing Canton Everett Delaware III travel on a few more adventures with the Doctor. I won’t suggest he is or isn’t a companion already, but I agree with Kat that the dynamic between Canton and the Doctor is potentially fascinating. Setting aside the sexual identity issue entirely, we do not often see the Doctor travel with another strong male. When he does, there is always interesting dramatic tension. I really, really liked Journey Blue. I’ve been a fan of Zawe Ashton for a while now (be sure to watch the all-too-brief series Case Histories with Jason Isaacs if you enjoy her work!). I fully expect she will return, although Jenna Coleman’s choice to stay might affect that. On a theoretical level, and honestly a little unrelated to the Confanion topic: What companion might I like to see in the near future? I think the next dramatic tension for Jenna Coleman in the story could come from a second companion—one who chooses to live in the TARDIS full-time rather than the by-appointment-only companion Clara has been in the past. Don’t get me wrong, I’m a huge fan of Clara, she is among my two or three favorites from the new era, but I think the series needs to mix it up and try more than one companion again for a bit. Thanks again Verities! I am so looking forward to this year’s topic as it unfolds! We didn’t discuss Jenny but I think she rivals Sally Sparrow for a popular choice based on fan buzz at the time and since. Sara kingdom is definitely a character I would’ve like dto see get a longer run. I would still count Sara Kingdom as a companion even if she only appeared in one adventure. If you include Big finish she has had a few more adventures and even if they are set in the middle of another they still count, to me at least. I wrote about this in Liz’s Companion Piece book coming up, but much though I love Sara Kingdom I also think that if she had stayed on the show for another year then she would have ended up being written more and more generic until there wasn’t much trace of her dark, interesting background. Lovely podcast as usual. A lot to think about, I feel. I’ve tried to give the notion of wanting companions that are like me, a bit more thought. I do think there’s something to that, definitely, but I also feel like I want companions that deserve to be with the Doctor. More along the lines of – if I can’t travel the universe then I don’t want anyone who’s less deserving than me to travel. From what I gather a lot of the outrage about Adam was that he wasted his chance and abused the opportunity. I fully buy in to companions that aren’t like me as long as they have some quality that makes them deserve the company. I do love Canton but would he work with 12 and Clara? Possibly, I think it would be really interesting to see 12 with another strong male. Something where there’s no competition about a girl, as Moffat seems to like writing. I’m still annoyed about his comment about the Doctor needing to be the alpha male and all that. One of the things I feel so strongly about Canton is that I want to give him a break. It can’t be easy living the life he lives and not being able to be open about who you love. I wan’t him to be able to travel somewhere beyond the constraints of his time. I’m very interested in more about what Kat thinks about Ianto. He is one of my all time favourite characters and I would love to have seen him as a companion. With or without Captain Jack. He’s smart, determined and I do love the fact that he has a very close relationship to the chaos that an alien invasion can create (i.e. the girlfriend). It’s interesting with characters that has been deeply affected with grief from what has happened and in relation to the Doctor’s deeds. On the subject of pre-internet fan discussions, I’ve been looking back (back… back… baaaack…) three entire decades (ulp!) to my collection of mint copies of the superlative mid-eighties (female co-edited!) fanzine Queen Bat. Not only did this zine contain excellent story reviews & poetry and a big meaty original instalment of Paul Cornell fiction in every issue, but starting from # 3, the editors ran a feature entitled “How About…?” in which a contributor was invited to put their case for a guest star who could’ve made an excellent series regular. The characters proposed in the “How About…?” feature included: Amelia Rumford (! ), The Pirate Planet’s Mr Fibuli, the Aztec Cameca, Russell from Attack of the Cybermen, the robot D 84… and the thespian-turned-highwayman Richard Mace from the early Peter Davison story The Visitation, the latter put forward by some bloke named… er, me?! And his ideal departure point would’ve been accompanying Will Chandler back into history at the end of The Awakening. Blimey, the amount of thought I must’ve put into the timeline for that article, when I should’ve been revising electrical capacitance & Faraday’s Laws for Physics A-Level! Shocking! And headcanon hadn’t even been invented back then! At the start of the fanzine article I mention my reasons for choosing Richard Mace: he had been voted Best Supporting Character in the DWM Poll for that season, and also, hmm, cheap fannish insult at writing & directing skills of Saward & Peter Moffatt, and, oh yes, although he appeared older than Davison’s Doctor (he was played by UK TV stalwart Michael Robbins, born 1930), the lowly intelligence of Richard Mace would emphasise the Doctor’s actual centuries of wisdom. Basically, a far less insulting and sophomorically arrogant way of putting it is: Richard Mace was charismatic as hell and a huge amount of fun and his inclusion in the show would’ve shaken the TARDIS way the heck up. Which is really all you need in a companion. Future confanions: Canton, because the script virtually promised he’d return that same season! (Canton is the human duck pond!) And Psi & Saibra, as long as their powers don’t become too, y’know, sonic-y. Great podcast, agreed with lots, especially thecompare & contrast of Old Who v. New Who tropes. Please keep doing that stuff! I believe Richard Mace was a character that Eric Saward had previously designed for a radio play or some other production – the reason he was so awesome was that the writer was far more invested in him than in any of the series regulars! Which may be an explanation many times over for why guest stars often shine over the Doctor and companions – as original creations, the writers feel more freedom with them and more interest in what they might do. First of all, I don’t think the ‘awesome guest star’ trend is Moffat-specific. This show has always had great guest stars: who can forget Camica from ‘The Aztecs’ or Jenny from ‘The Dalek Invasion of Earth?’ How about Anne Travers or Isobel Watkins? The Moffat era has plenty of fabulous side characters – I too love Psi and Saibra, and think Rita would have been a wonderful new direction in companions – but truthfully, so does the entire run of the show. Secondly, regarding the ‘Adam test,’ I am not convinced that Adam himself counts as a companion. Yes, he appears in two episodes and travels in the TARDIS, two criteria often held against the Sara Kingdoms and others like her. However, the Doctor took him on only as a favor to Rose, as a kind of pretty toy; he never had any proper companion characteristics or credentials. Rose thought he would be a good fit because he wanted to see the stars, but he turned out to be cowardly, self-serving, and irresponsible. Even Turlough, the traitor, managed to make himself more useful than that. Plenty of characters who fit neither of the other criteria – multiple episodes, TARDIS travel – do more for the Doctor and his mission than Adam. So while he may check a couple of critical boxes, I don’t personally consider him a companion at all. Finally, my personal choice for returning character would be Nasreen Choudhry. Wonderfully written and delightfully played (by fangirl Meera Syal), she is an intelligent, active woman, a scientist, fascinated by the potential of the TARDIS, with a sense of humor and adventure and no difficulty putting the Doctor in his place. She is also, coincidentally, non-white and over 40, which would be a nice switch. The resolution of her story leaves the door open for a return; while I don’t expect one, I would absolutely love it. There are many great possible companions out there! One I thought of was Elton from Love and Monsters. If anyone deserves a spin in the TARDIS at least once, it’s that guy. Journey Blue was also mentioned, who I wouldn’t mind seeing again in Series 9. I’m with you guys that I’d love to see a 2nd companion in the TARDIS this year. One request. When you throw out a name of a lesser or one time character, could you also give a short description, like, Adam, the guy from first season who got a port put in his forehead (or the episode they were in or something like that). I got lost sometimes in this episode with all the name dropping. You’d be half way through the conversation before I’d figure out who you were talking about. I suppose this was especially troublesome with this topic because we were talking about characters that we only saw once or twice and may have forgotten about. Thanks! Thanks for the reminder. We do try to give context but sometimes the conversation gets ahead of us. We will try harder! I am heartbroken, HEARTBROKEN, that no one mentioned Ross Jenkins. 😛 Given the fact that I am in completely in denial about his fate and totally have a headcanon to support that (it was only a graze! A flesh wound! ), he is completely my choice for favourite companion that never was. Though he should probably stick with 10 and maybe 11, because I suspect he and 12 would NOT get on. Seriously, the idea of 10, Donna and Ross in the TARDIS gives me warm fuzzies. They would be hilarious! Rita was another I would have liked to have seen more of. As for this year’s batch (there were quite a few) Psi and Sabre are both characters I would like to see more of. Saibra is already a companion based on my Are They In Doctor Who: Legacy rule. As is Santa. Oh, Ross (who is totally still alive and being adorable somewhere). I think he’d only work with the Tenth Doctor but it would have been glorious. And adorable! Though mentioned by both Tansy (in the podcast) and Elisabeth (above), I’ll throw Samantha from the Faceless Ones in the mix again – she was one of the first ones that came to mind as a companion who never was. Any time you get significant character development out of the blue, it triggers that notion that a plan is afoot to bring in somebody new. good topic – I’ve enjoyed this discussion! The second and third novel companions, Roz and Chris, on the other hand, did the equivalent of the guest star who gets upgraded to companion. The novel they appeared in, Original Sin, was originally intended to introduce a different character as the new companion, but by the time it saw print it had been decided that he wasn’t working out and that Roz and Chris were better companion material, so it was them who got into the TARDIS at the end. Thank you Veritys for one of your best podcasts yet and I’m not just saying that because I was one of the listeners who suggested ‘might have beens’ as a topic or even even because you mentioned my suggestion that Rita from the God Complex, as a Muslim companion, was a missed opportunity. As to classic series comfanions, I’ve always felt that Dorothea Chaplet the Heugenot from the Massacre would have made a far more interesting contrast with the First Doctor and Steven Taylor than the bland Dodo played by the same actor- Jackie Lane. If Kat can declare Canton Delaware Everett III a Companion (a declaration logically defended by Kat, with an approach that I agree with), then I’m declaring Osgood my favourite Companion (especially if you take possible alternate timelines into account)! Thank you, Kat! Thank you, Canton! Thank you, Osgood! Regarding intergenerational companions. DONNA AND WILF NOBLE?! Incidentally my favourite two new-who companions. Wouldn’t it be a cool plot line if Donna and what’s his name’s kid became a companion and could NEVER tell Donna what they were up to? There isn’t a guest star I could honestly say I’d like to see as a proper companion. Nor one I really wouldn’t want to see. It’s hard to tell from a companion’s first story, when they are essentially a guest star, how they will end up working as a companion. Is Jamie mind blowingly great in the Highlanders? Not really. Who would’ve thought Donna would’ve made an absolutely brilliant companion from how the character appeared in the Runaway Bride? They were both fine and solid characters but I don’t think they screamed companion. Martha Jones was quite good in Smith and Jones but then ended up spending an entire series being a second string companion in the TARDIS having to share the spotlight with the ghost of Rose. I haven’t seen all too much of Ben’s and Polly’s adventures but while I quite like them in their first story they don’t seem particularly interesting going forward. A companion is mostly what the writers decide to do with the character once they’re actually in the TARDIS regardless of their backstories and it strikes me as just about pointless to speculate on which one would have been great if they’d been given the chance. Most probably could have been great. Most probably wouldn’t have been much out of the ordinary. That said there is one guest star. Or rather a period when I think the show probably could have used that guest star as a companion to good effect. Lady Christina de Souza from Planet of the Dead. Yup. Not an amazing character by any stretch but a capable actress in an interesting enough role and most importantly a time in the show’s history, the dreadful gap year specials, that could have used a little less focus on the Doctor and how sad he was and what a shame it all was that he had to regenerate. A companion during those four episodes might’ve helped drag the Doctor’s head out of his own behind slightly. Then again the real problem might have been where the writer’s and showrunner’s head was at and throwing in a companion might not have solved that. I think it probably wouldn’t have hurt though. Another fantastic show. But you unaccountably forgot to mention my favorite should-have-been companion, Todd from Kinda. She and Five are great together. It would be great if Big Finish did a series with Todd, Nyssa, and the Fifth Doctor. I bought most of the novels and the first few dozen of the BF audio (have recently started listening & purchasing them again – will get to Zagreus in about 2017 & Hex sometime about when I’m due to retire). There’s obviously a big change in character for Ace between the end of the classic (‘proper’ for some of us 🙂 ) series and the Virgin novels. I’d be interested to hear a discussion about the change in character of the companions as they shift between different media formats, especially as the older companions these days are now written by those of a later generation who are filtering them through the eyes of a later worldview. Love the show. I was surprised by everyone’s choice for best one-off guest star. Mrs. Moore was one of the best parts of Rise/Age and I had forgotten about her till Deb made her choice. My own vote would go to Professor Amelia Rumford, a character that gives me the joy from the moment she first appears on screen in The Stones of Blood. Two honorable mentions for Amelia Ducat from The Seeds of Doom, Dr. Todd from Kinda and Olive Hawthorne from The Daemons. Thanks! Mrs. Moore was one of those subtle characters that made an impression quickly. I think it really comes down to chemistry with the Doctor and she had it in spades. Amelia Rumford has certainly been getting a lot of love…we may have to revisit her! One that is bound to be done at some point, but I have mixed feelings about, is Rachel Cooper (BF Architects of History). In one sense she is very much a companion (before she dies and is wiped out from history). In another, she feels very much like an almost pastiche of Rose and, as such, would never be an actual companion. Still, I would happily listen to a few seasons of her to see how she developed. And the Doctor’s great grand son, Alex. *sobs*. That would have been lovely. But my favourite companion who never was .., the Master. He basically is a companion in season 8 (hell, he should have asked the Doctor to have been his companion and he could have escaped and would have had wonderful adventures together). But, the shoe seriously has to make the Master/Mistress a companion for a full season one day. Yeah, most episodes would involve him/her pretending to help while secretly trying to kill the Doctor or use him for his/her own ends, but, hey, it worked in the Black Guardian trilogy. Finally, what about Chang Lee. I have my problems with the movie, but no one can deny McGann’s performance and I’m always happy to watch it. However, while Grace more or less worked in the film, I could never see her working as a companion. Chang Lee, however, would have been fantastic. Kind of a cross between Adric, Turlough and Ace. I don’t see the writers having much they could do to develop Grace’s character, but Chang Lee could have had a very interesting character arc. I actually can’t argue with anything in your comment -the Master would have been amazing and so wonderfully snarky. And while I really like Grace, I think her ending was perfect. Chang Lee, on the other hand, had a lot of story left in him. My favourite ‘should have been’ audio companion who doesn’t make me cry is the awesome DI Patricia Menzies (Anna Hope AKA Cat Nun from the TV show) who appeared with Colin Baker and India Fisher in The Condemned & The Raincloud Man and later (earlier) met the Sixth Doctor with Evelyn & Thomas in The Crimes of Thomas Brewster. She was fantastic, snarky and clever and obviously needing something OTHER in her life once she discovered that basic police work couldn’t do much against aliens and monsters. She so wanted to travel with the Doctor but he turned her down because he was too worried about WTF was going on with Charley Pollard. Then when he was companion-free he took up with some teenager called Flip instead of going back for DI Menzies who would have been SO GOOD FOR HIM. I still get cross about this sometimes. I had forgotten about DI Patricia Menzies. You’re absolutely right. Because you’re right, she deserves to be a companion, and had she not turned up during that heartbreaking stuff with Charlie, she would have been. Jeez, big finish really put us through a lot, don’t they? I’ve not finished the Hex stuff yet, I’m still in recovery from Death in the Family. Oh! Yes! One big vote for DI Menzies! It’s long past time to have a Mancunian in the TARDIS! Osgood, Jago & Litefoot, Amelia Rumford, – Is there going to be an episode on the book companions? If so, Fitz and Anji with the Eighth Doctor are awesome! Can I choose Victorian Clara as my potential companion? Wouldn’t it have been even more emotionally scarring if she’d travelled with the Doctor and then DIED and he’d had to go find Clara Prime? I want Kate Stewart to travel on the TARDIS, inter generational but since science leads wouldn’t she want to see all of time and space? Akso, like the Brig, she often has that dynamic tension with the Doctor about who is really in charge. I never got over the joyful idea of Oswin as a companion – a Dalek in the TARDIS, how bold and original! Plus an inner cute girl to satisfy the BBC heads of the ‘standard type’. Remember all the amazing Oswin fan art with her egg whisk? I still want Oswin back, in Dalek form. I tend to veer less towards companions/near-companions that are like me and more towards those I’d like to travel with in the TARDIS. The chemistry between the Doctor and the potential is the biggest key. As Tansy mentioned, Ray in Delta & the Bannermen had a great chemistry with McCoy’s Doctor. Ace is one of my absolute favorite companions. Even so, I’ll always wonder about how fantastic a 7/Ray team could’ve been. Even cooler would’ve been them bringing along Earl Sigma at the end of The Happiness Patrol. This was an excellent start to The Year of Companions! Thank you! On that sad day when Clara exits, I would love see Psi, Saibra and Journey Blue occupy a crowded, Fifth-Doctor-style TARDIS. Writers complain about the difficulty of fleshing out multiple companions, but I remain convinced that, in the right hands, ensemble pieces can be done effectively; so, that’s where my vote is going. Looking ahead, I’m excited to hear the eventual Verity! conversation about Donna Noble. On a more general note, I just want to thank the six of you for rocking my world. You essentially guided me through Season Eight last year, making me appreciate it on a much deeper level than I ever would have imagined — and that experience changed my life. Verity! has certainly encouraged me to think about the greatness of Doctor Who, to reflect upon my identity as a fan; but beyond that, in everyday life, your insightful, engaged and mutually respectful conversations are also prompting me to discard my cynicism, embrace my enthusiasm, and connect with others in a more authentic way. And I’m a Nerd with a Purpose. This year will be all about watching the entirety of the classic series in chronological order (Paul Cornell calls it “the Pilgrimage”), which will hopefully spark further creative endeavours. So, thanks again for all the good vibes; I am a living sign that you are having a positive effect. Here’s to 2015! As far as I’m concerned, this is the highest form of praise possible for a show like ours. I couldn’t be more honored than I am right now. And this has been a rough few weeks for me personally. Knowing I helped make a positive difference in someone else’s life is helping make me feel better about life too. It all comes around! It makes me happy to know that my feedback made you feel better. Keep that good karma going! Another point: the budget and writing for the sixth and seventh doctors is uniformly mediocre (I’m inviting ripostes, I know) and you need to salt and pepper those in with the smashing stories of Doctors 1-4. And finally, the fifth doctor is good to relax with, sort of like new-age music. Watch him when you’ve had a stressful day. I know the makeup makes it impractical, but Chantho from Utopia was someone I would have liked to see more of. She was the blue woman who started all her sentences with “Chan” and finished them with “tho” because it would be rude not to, and she was the last of her kind. She actually WAS a companion to the Master while he was in human form. While it maybe would get old quickly to have all sentences bracketed with “Chan/tho,” I think it would have been very interesting to have a non-human companion who obviously comes from a very different culture. I agree that Mrs. Moore would have been a wonderful companion. She absolutely had that essential spark. However, her family isn’t dead. She ran away from home and joined the resistance to protect them, after stumbling upon dangerous knowledge at work. Before dying she gives the Doctor her real name, and asks him to find her family and tell them what happened to her – a duty he passes on to Mickey and Jake at the end. Had she lived she would have returned to them, happy with her ordinary life. I do hope to see someone like her in the TARDIS sometime. I love her humor and her upbeat attitude. I love that she taught herself all that techie stuff she did – because it was needed, not because she was a natural at it. I’d love to have another older companion; not another Donna, though I loved her, but someone like Mrs. Moore or Nasreen Choudhry or Evelyn Smythe. Someone who’s done things, seen a bit of the world, and wants now to see a bit of the universe. I realize I’m very late to comment here, but I’ve just watched The Greatest Show in the Galaxy and have to wonder if I’m alone in thinking Mags could have been a great companion. I loved her irritable post-punk attitude, the Siouxsie Sioux style, and most of all, the idea that a companion could become an adversary depending on the state of the moon.